At Medieval Armour, we pride ourselves on offering a wide assortment of different pieces of chainmail armour. Why? Because one warrior's needs are different from another, and so it is better offer a wide assortment of pieces of medieval chainmail, to ensure that when a warrior comes looking for mail armour, we can provide just what he or she needs. Chainmail, or maille armour, as it was called in the earlier years of its use, is one of the oldest styles of metal armour in use. Traditionally, it consisted of small rings all linked together in a distinctive pattern that afforded a great degree of protection. Roman chainmail was a common enough armor in its day, being favored by both experienced soldiers and new recruits for its lightness (in comparison to heavier, plated armours), as well as its ease of acquisition. And medieval chainmail was so effective that it remained a common armour for centuries! Here, we offer a wide assortment of different mail armours, ranging from light-weight chainmail armours for show to functional chainmail that's fit for use in battle. And of course, we don't just offer chainmail shirts or chainmail hauberks for protecting only the chest, but a wide assortment of pieces for protecting virtually any part of the body! 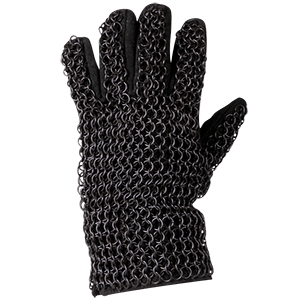 That's right, we offer chainmail gauntlets, which will keep your hands safe, and we offer chainmail chauses and chainmail leggings to keep your legs healthy and whole! And in addition to typical chainmail hauberks and chainmail shirts, we even have a few chainmail vests, to help reduce weight while still affording a good degree of protection. When you're looking for just the right piece of chainmail armour to protect you in a fight, make sure you look to Medieval Armour to provide you with just the piece of functional mail armour that you need. Chainmail coifs and mittens are all well and good for added protection, but what a warrior really needs is a good suit of chainmail to keep him protected in battle. 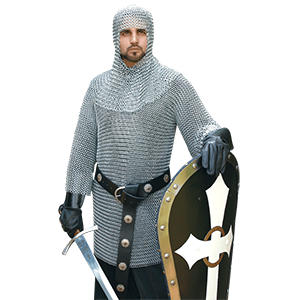 And at Medieval Armour, we offer a number of good chainmail hauberks and chainmail shirts, all designed to keep you perfectly protected and make you look like an authentic medieval warrior. We offer a number of great chainmail hauberks, made in a variety of different ways to provide a bevy of choices to the warrior in need of armor. Called maille in the ancient days, our chainmail armour is made in several different ways, ranging from the shape of the rings used in the mail to how the rings in the chainmail are closed. For instance, in our riveted chainmail, the rings are closed via rivets, which provide an added touch of protection, while increasing the mail armour's weight, where-as our butted chainmail simply butts the ends of the rings together. Another example is that our flattened chainmail features mail rings that have flat sides, while rounded chainmail features (you guessed it) mail rings that are completely round. We also offer a number of chainmail shirts, which are traditionally shorter than a hauberk and thus, weigh less. We even offer blackened steel chainmail to provide for that incredible and intimidating look that only dark armour can give! 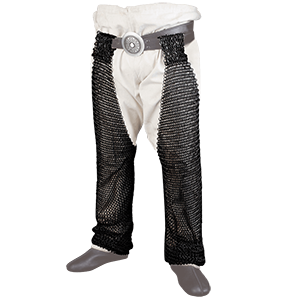 And for those warriors who want the authentic look without the need for actual battle protection, we have aluminum chainmail shirts, too, which are perfectly suited for stage productions and show! If you're looking for chainmail armour, whether you want a functional chainmail hauberk for battle or a lightweight chainmail shirt for show, then Medieval Armour is just the place where you want to be, so take a few moments to browse our Chainmail Hauberks, Chainmail Shirts, and Maille Hauberks until you find exactly what you need! There probably isn't a warrior in history who didn't understand the importance of one's head in battle. And because the head is important, at Medieval Armour, we offer a number of historic pieces of chainmail armour, ranging from chainmail coifs to chainmail hoods and more, all to ensure that your head is protected in a true medieval fashion. We offer a wide range of chainmail coifs, many made from 10mm chainmail and many made to standards that enable them to provide more than adequate protection when it comes to their function as functional medieval armour. 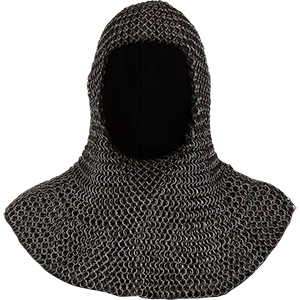 Like any piece of chainmail, our chainmail hoods and coifs can come in different styles, ranging between round ring chainmail to flat ring chainmail, to riveted chainmail, to the more common butted chainmail. The only similarity between all the styles we offer is that each one is steel chainmail, to ensure its authenticity and its effectiveness in battle. Even our pieces of blackened chainmail are steel, ensuring that they are as effective as they are intimidating! Whether you're wearing it for show or for protection, any time you march into battle, it's always a good idea to have on a good piece of chainmail head armour, and the best place to find such a piece is right here, at Medieval Armour. While covering the critical areas of the head and torso when fighting remains important, make sure you do not neglect the rest of your body! Our Chainmail Arm and Leg Armour offers a number of excellent chainmail armour pieces that provide increased protection to your limbs. Crafted in a number of styles and from various materials like steel and titanium, the chainmail skirts, chainmail voiders, and chainmail chausses that we carry cover these vital areas to keep you in fighting shape. You can find dome riveted chainmail, wedge riveted chainmail, flattened chainmail, butted chainmail, and other construction styles to find the perfect level of utility and authentic appearance for your needs. When you want to dress as a knight for weapons re-enactments or the Ren Faire, you can find the right medieval chainmail here at Medieval Armour!